Bruxism refers to habitual grinding and clenching of the teeth. This problem usually occurs whilst asleep, but can also occur during waking hours. Bruxism puts massive amounts of pressure on your teeth and the muscles of your face and jaw muscles, bone and joints. As result, it can cause a whole range of problems, including discomfort and headaches, through to TMD (temporomandibular disorders). Bruxism also causes a range of dental issues, from loosening and chipping of your teeth, right through to fracturing your teeth. Chronic, untreated teeth grinding can wear your teeth down to stumps, which then necessitates expensive dental restorative treatment, such as crowns, bridges, root canals, implants and dentures. Much of the time, people are unaware they are grinding their teeth, as it most commonly occurs whilst asleep. Waking up with sore jaw joints and facial muscles or the feeling that your teeth are loose on waking can be signs of nocturnal bruxing. It’s highly likely that your partner will also notice or hear you grinding your teeth when asleep. 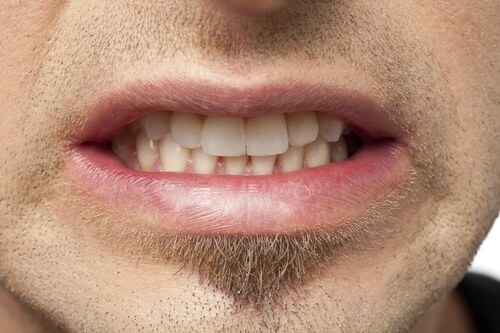 Bruxism can be caused by stress and anxiety, a malocclusion (abnormal bite) or even by obstructive sleep apnoea. It is important to identify the cause of the bruxing in order to make sure appropriate treatment is provided. In order to help treat bruxism, Dr Anna and Dr Stefan may advise that a splint (or night guard) should be made specifically for you. This should then be worn nightly to protect your teeth and help prevent muscle and jaw tenderness and headaches. The most comfortable and effective mouthguard is one that is custom made for your mouth. So, we take a model or impression of your mouth and teeth, from which to create your guard. The end result is a perfect, comfortable fit, for a great night’s sleep. Treating bruxism helps to maintain the health of your teeth. It can prevent chipping, breaking and wearing down your teeth. Treating bruxism as quickly as possible can help avoid more expensive and extensive dental treatment in the future. Treatment can help to prevent or lessen any side effects of grinding your teeth, including jaw joint pain, TMD, headaches, muscle tightness and tenderness around your head and neck.